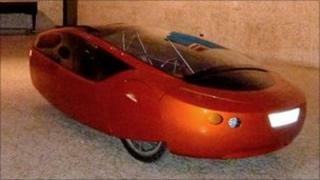 The Urbee uses electric motors, backed up by a small ethanol-powered engine, and is capable of 200mpg. Although the vehicle has been in development for several years, its complete printed body shell has never been seen publicly before. Only one Urbee currently exists, but its makers hope to go into commercial production by 2014. The use of "additive manufacturing", where layers of material are built up, or "printed" to form a solid objects, contributed to the car's green credentials, according to project leader Jim Kor. "One only puts material where one needs it," explained Mr Kor, who unveiled his vehicle at the TEDxWinnipeg conference. "It is an additive process, building the part essentially one 'molecule' of material at a time, ultimately with no waste. "This process can do many materials, and our goal would be to use fully-recycled materials." Currently it is only the Urbee's body panels that are printed - by Minneapolis-based Stratasys. However, Mr Kor said he hoped that other parts would be produced this way in future. This process could revolutionise how we make things. It has certainly changed my way of thinking about manufacturing. Typically 3D printing is used for prototyping - making one-off versions of items as part of the product design process. However, it is increasingly being mooted as a solution for distributing physical objects without the need for shipping. Among the many fields expected to embrace the technology is the medical profession, with equipment and even prosthetic body parts potentially being printed. "This process could revolutionise how we make things. It has certainly changed my way of thinking about manufacturing," said Mr Kor. He pointed out that the same computer files used to make miniature prototypes of the Urbee were used to manufacture the full size version. "This way, we knew the big panels would all fit properly," he added. Underneath its aerodynamic shell, the Urbee is designed to achieve maximum efficiency with minimum input. Its tiny single cylinder engine generates just 8 horsepower, but is capable of reaching between 60 and 70 mph. As well as charging its batteries from the bio-ethanol motor, it can also draw electrical charge from optional solar panels, potentially reducing fuel consumption to zero. Far from being a fanciful experiment, like some "hyper mile" vehicles, the company developing Urbee, Kor EcoLogic, insists that it could become a viable runaround for normal people. Estimated prices range from $10,000 (£6,500) - $50,000 (£33,000) depending on whether the Urbee can achieve mass production. Mr Kor is optimistic about timescales: "I believe the best-case scenario would be 2014." "This would be the first practical, roadworthy car that could run on solely renewable energy," he said.